Bill Hallo of North Port, Fla. fired the 16-inch main guns on the stern of the battleship USS South Dakota in some of the major battles in the Pacific during World War II. He was aboard ship firing away at the enemy at: Guam, Saipan, Tenian, New Guinea, Philippines, Luzon, Formosa, Iwo Jima, Okinawa and Japan. The South Dakota was Fleet Adm. “Bull” Halsey’s flagship and Hallo was the admiral’s favorite sailor aboard ship, or so he recalls almost 70 years later. Just by happenstance the young swabbie became his boy. Hallo was a guard on the admiral’s deck on the South Dakota. It was the deck above the commanding captain’s. “There was a bunch of officers on the deck when I arrived. After taking a look at me they started talking among themselves about my age. The Director was an armored box with three-inch protective steel sides. It also contained the ship’s radar. 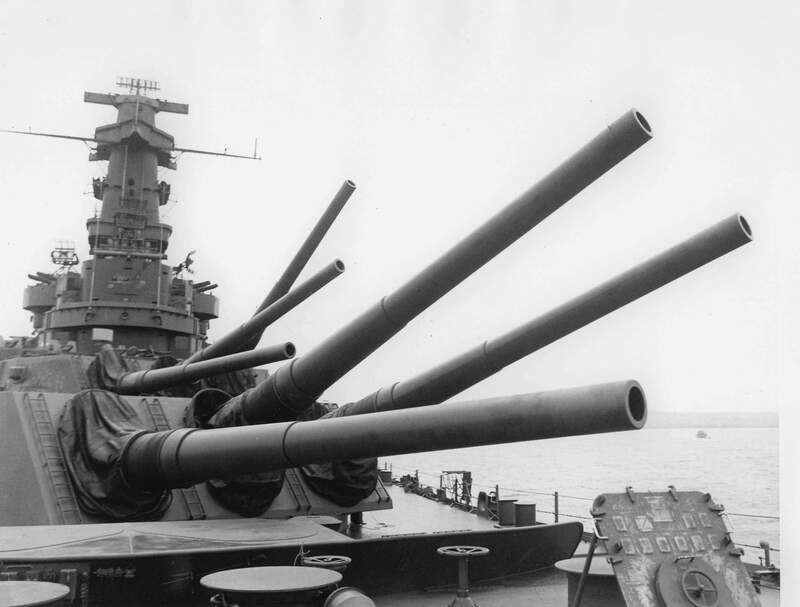 The Director was 30 or 40 feet away from the main stern gun turrets. Hallo went aboard the South Dakota at Pearl Harbor in May 1944 and sailed for Guam and the war zone. “Guam is where the Japanese told the civilians, if the Americans captured them they would cut their tongues out and gouge out their eyes. Whole families jumped off 100 foot cliffs into the sea to escape being captured,” the old sailor recalled decades later. “From Guam we sailed for Saipan. The South Dakota helped out the Marines who were trying to capture the island by knocking out Japanese gun emplacements just off the beach,” he said. “We came in close to shore at Saipan hitting map coordinates called in by Marines. In mid June of 1944 the South Dakota played a part in the Battle of the Philippine Sea. It was here the Japanese dropped a 500 pound bomb in the center of the ship’s main deck, killing or wounding 50 sailors. The battleship kept fighting despite the severe damage from the enemy bomb. In two days of fighting the Japanese lost more than 550 airplanes. American pilots called it “The Great Marianas Turkey Shoot.” In addition, they also lost three fleet carriers. American losses totaled 123 planes and the wounded and killed in the bombing of the South Dakota. She was the only American ship that sustained major damage during the battle. That wasn’t the case at Iwo Jima when the American flag went up atop Mount Suribachi. The battleship USS South Dakota played a major roll in many of the historic battles of the Second World War. Bill Hallo was aboard ship at Iwo Jima, Okinawa and the attack on the main Japanese islands. Photo provided. Adm. Halsey and the fleet moved on to the biggest Pacific battle of World War II–Okinawa. Hallo and the South Dakota spent most of the next 82 days bombarding targets on and around Okinawa. Then the battleship and is crew moved on further east. On July 13 1945 the South Dakota brought all of her main guns to bear on targets on Honahu and Hokkaido, two of the Japanese home islands. The ship’s crew spent the next couple of weeks bombing Japan. When the first atomic bomb was dropped on Hiroshima on Aug. 6, 1945 and the second bomb was dropped on Nagasaki three days later, the South Dakota and its crew were just off shore. “We were close enough to Hiroshima to see the explosions. It was the same way at Nagasaki when the second bomb went off,” Hallo explained. “We had been bombarding Japan at the time the second atomic bomb exploded. We saw that one too. “We were off the entrance to Tokyo Bay on Aug. 13, 1945 and were leaving the area when it came over the radio Japan wanted to surrender. Halsey turned the battleship around and sailed back into Tokyo Harbor. “The next morning Halsey sent 20 Marines ashore each with a Thompson submachine-gun. When the Marines returned they told the admiral the Japanese wanted peace. “They were going to sign the surrender treaty aboard the South Dakota until the Battleship Missouri showed up the next day. Since Truman was president and he was from Missouri, it was decided the signing would be aboard the Missouri,” he explained. Hallo and Halsey sailed home aboard the South Dakota. When they reach Long Beach, Calif. the admiral left the battleship for the last time. Hallo will never forget that day. “When Halsey left the ship for the last time the crew was on deck. They put me at the gangplank. Halsey reached the gangplank where I was. He stopped and turn toward me. He stared at me for five or 10 seconds, then saluted. “‘Permission to go ashore,’ he said to me. “‘Permission granted, sir,’ I replied and returned his salute. After the war Hallo went to work for Pratt & Whitney, makers of airplane engines. He worked as a machinist for the company in East Hartford, Conn. for the next 39 years. He and his wife, Anita, have been married 65 years. They moved to North Port in 2000. The couple has two children: Kenneth and Joanne. Battles/Campaigns: Battle of Santa Cruz, Savo Island, Iceland, Greenland, Bear Island, Gilbert Islands, Nauru Island, Marshall Islands, Roi and Namur, Turk, Guam, Saipan and Tinian, Palau, Yap and Woleai, Hollandia, Ponape, Guam, Saipan, Leyte, Luzon, Okinawa, Manila, San Berardino Straits, Formosa and many strikes on Japanese fleets. This story was first published in the Charlotte Sun newspaper, Port Charlotte, Fla. on Monday, Dec. 8, 2014 and is republished with permission. Click here to view Hallo’s collection in the Library of Congress. 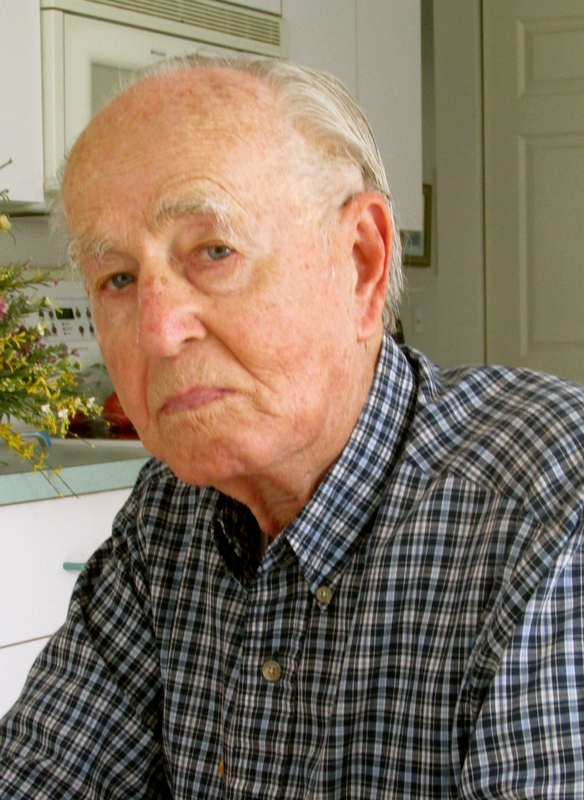 William R. Hallo, 89, of North Port, FL, died on Jan. 20, 2016. A military service will be private for the family at the Sarasota National Cemetery. Funeral arrangements by: Farley Funeral Home in North Port. Dates are interesting, since the Santa Cruz island campaign was Oct 1942, and Savo Island was Aug 1942. Joe – Are you implying we’ve got something amiss here? Please explain further. Thank you.